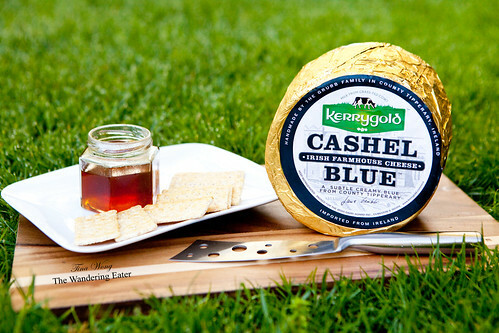 Recently, I’ve received a large wheel of Kerrygold Cashel Blue Cheese. Since I love cheese of every kind my mind was buzzing with ideas as to what to do with it. 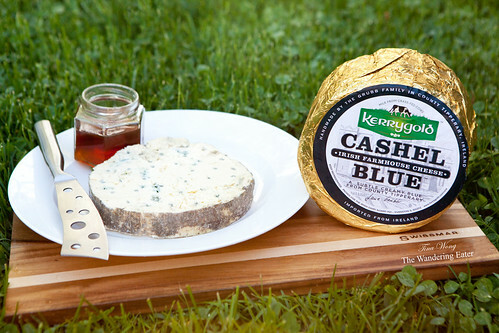 Cashel Blue cheese has a unique, voluptuous, creamy texture with a minerally undertone (I even taste malt) complemented by a delightful, mild blue tang. It’s a cheese that has lots of big flavors that could stand up to a lot of robust foods, beers, and even a good Pinot Noir. Since Cashel is a robust flavor, I stuck with baking savory. 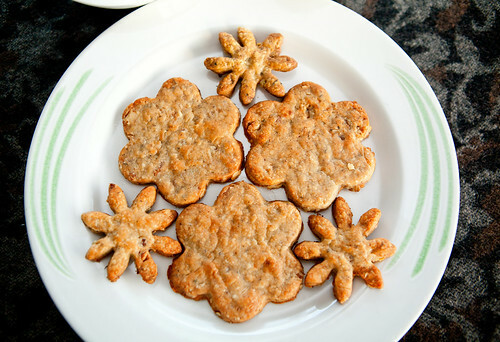 The easiest recipe would be the savory walnut and blue cheese shortbread cookies. This would be great for a simple snack (that’s too hard to resist as my family made them disappear in less than 1 hour!) that even children can do this as well. Beat the butter and blue cheese until blended (don’t worry about lumps of cheese); add the flour and walnuts. Shape into a log, wrap in parchment or plastic wrap and refrigerate until firm or freeze for up to 6 months. To bake, slice 1/4-inch thick and bake on line it on a Silpat or parchment lined baking sheet at 350°F for 10 minutes, or until pale golden around the edges. Makes about 2 dozen. *If you want to do cut-out shapes like I did, take the refrigerated dough, dust your counter with flour and roll out the dough until it’s about 1/4-inch thick and take a cookie cutter (any shape you like) and stamp them out. Place them onto a Silpat or parchment lined baking sheet and bake it for 15 minutes or until golden brown around the edges. If you’re more daring and want to bake bread like I did yesterday, you may bake a complex cheese bread, a rye rosemary Cashel blue cheese bread. It is not 100% rye before the rye’s spicy flavors would dominate the Cashel but a small percentage does make the bread much more interesting than regular flour. 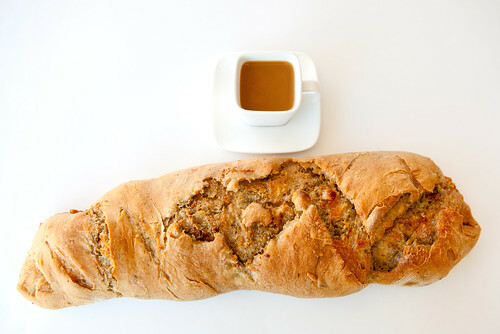 The addition of rosemary adds a fresh, herbaceous aroma and flavor to the bread as well. I should mention that the Cashel blue cheese is rolled into the bread. It’s the kind of bread you can make a delicious sandwich with or it’s great by itself. In a mixer bowl whisk together the unbleached all purpose flour, dark rye flour, the honey or sugar, black pepper, rosemary, and yeast. Then whisk in the salt. Using the dough hook on low speed (#2 Kitchen Aid) add the 1 cup of water and mix about 1 minute, until the flour is moistened. Knead the dough on medium speed (#4 Kitchen Aid) for 7 minutes. The dough should be very elastic and jump back when pressed with a finger tip. The dough should still be a little tacky (sticky) but not cling to the fingers. If the dough is very sticky knead in a little flour. If it is too stiff spray it with a little water and knead it in. Dust it lightly with flour and cover it with plastic wrap. Allow it to relax for 20 minutes. Turn the dough onto a lightly floured counter. Shape it into a log that is about 10 inches long. Roll out the dough to rectangle shape using a rolling pin until it’s about 1/2 inch thick. Spread the blue cheese into a thin layer, about 1/8-inch but leaving about 1/4-inch space from the edges, and roll it up tightly. Pinch and roll out the seams (so the cheese won’t leak that much while baking). The shape should be a thick batard (think baguette shape but thicker on the middle). Set it on Silpain or parchment and cover it with a large container or oiled plastic wrap. Allow the dough to rise (ideally at 75°F to 80°F) until almost doubled, and when pressed gently with a finger the depression very slowly fills in, about 1 hour. Preheat the oven 1 hour before baking time preheat the oven to 450°F. Have the oven shelf at the lowest level and place a baking stone or baking sheet on it and a cast iron pan or sheet pan on the floor of the oven before preheating. 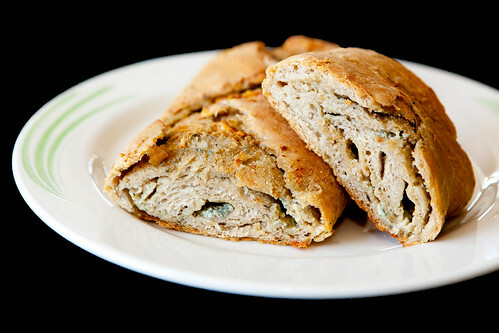 Shortly before baking, brush the surface of the dough all over with olive oil. Slash the dough. Toss 1/2 cup of ice cubes into the pan beneath and bake for 20 minutes. Turn down the heat to 400°F and continue baking 10 to 15 minutes or until deep golden brown. (An instant read thermometer inserted into the center will read about 211°F.). Remove the bread from the oven, lift it from the pan, and transfer it to a wire rack to cool completely, top-side up.